Social media can be a strange thing. For example, no matter how real I try to be about myself, people still tend to assume I'm naturally an outdoorsy/adventurous person. They'll meet me and say something like "I was afraid of [insert activity] so I tried to channel Abbi" and I'll laugh. Because if you were afraid doing an activity and you successfully channeled me, you were probably on the ground in tears minutes later. The people that know me best (my brothers, Callen, etc.) would not be quick to describe me as fearless and the word perseverance would only be mentioned when describing qualities that I lack. Now, this is not because they are rude, or too hard on me, this is purely because of my own actions (or lack thereof) and the way I've dealt with discomfort or fear in the past. That being said, I like to think I've grown a lot in the past year, doing more things that scare me and growing comfortable in situations that I used to fear. I credit a lot of that to a book I read last winter called Learning to Fly. Callen also deserves some credit, but I hate to say that because I don't want him to use it over me next time I'm panic-bearing about something :) So. 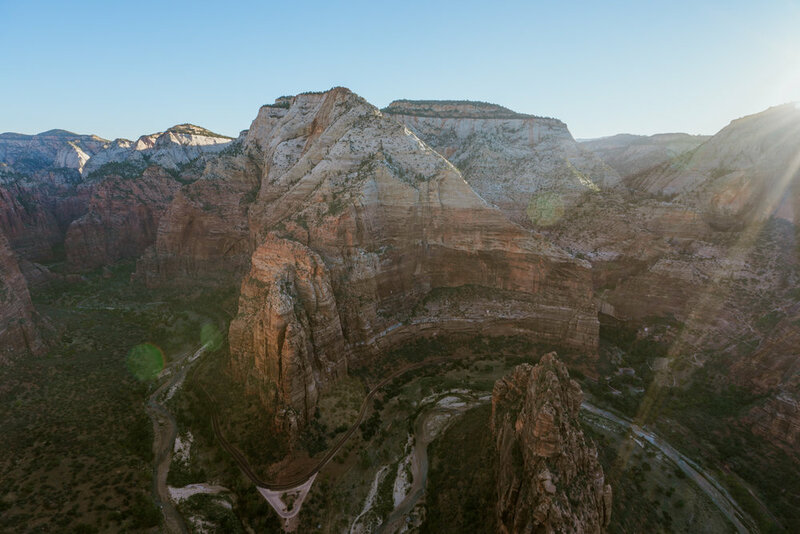 With that in mind, I would like to give you a full, honest account of our day in Zion National Park two weeks ago. We wanted to hike Angel's Landing. 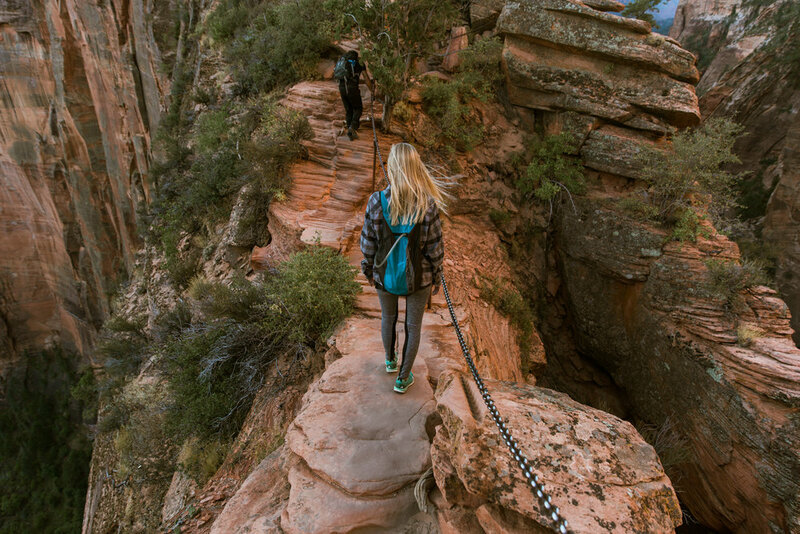 I wanted to want to hike Angel's Landing...but I was nervous. I had heard the horror stories. I knew how many people had died on the last section...I didn't care that statically I was more likely to die of a heart attack than falling off the cliff, all I cared about was the fact that it was high-consequence, despite it being low-risk (for me). But I promised Callen I'd hike to the chains (the scary part) and I'd try it. I'd go until I was uncomfortable, then try my best to evaluate if my discomfort was logical before deciding to turn around. Ugh you guys sometimes I wish I could just be chill and not over-analyze things (I'm sure Cal would agree) but I went into it hopeful and gave myself permission to back out. But before we even get to that part, I must start with the beginning of the day. We wanted to get to the top before the sun covered the valley in harsh light, so we decided to start early. Callen's idea of starting early meant waking up at 4:30am and biking five miles into the canyon so we would beat the first tram of tourists to the trailhead. Well. As per usual, Callen over-estimated how in shape I am (read: not at all) and (BEING REAL HERE) I was in tears by mile 3. It was a low point for me. I'm not a morning person, and I'm definitely not a 5-mile-bike-ride-up-a-hill-before-sunrise morning person. Please just take your time to laugh at me. I am not ashamed (yeah I definitely am) but the bottom line is, tears were shed, a fit was thrown, and we ended up hopping on the tram for the last mile (because yes, it caught up to us at our not-so-fast pace). Thankfully, Callen is a saint and he still loves me and we were able to move on to our hike without too much drama once we made it on the tram. Are you convinced I'm not outdoorsy yet? So, here we are at the trailhead with 1.5 hours until sunrise and my legs are feeling like noodles. But guess what? I pushed through because I am a persevering, outdoorsy, chill wife!!!! Ha. So maybe I was still stewing a bit (who is ever in a good mood while going up a ton of switchbacks?) BUT we made it up. We didn't quit! We finally arrived at the chains and, feeling in a much better mood, I told myself I was really going to do this. We didn't take a break before (mostly because I was afraid my legs would truly become noodles if I stopped walking), but I turned to Callen and said "I'm going for it, but if I chose to turn around, promise you'll let me turn around" Once again, I really wish I was less dramatic, but it's just how I am. So on we go, and guess what? I did the scary part! And honestly never got scared! I kept thinking "surely this will get worse" but it never did. By the time we made it to the top, I was feeling pretty awesome. We made it just in time for the sun to peek over the canyon walls and it was honestly one of the most beautiful hours of my life. It was pretty surreal to sit up there with Callen and reflect on all the times I had feared this hike. By the time we made it down, the drama of the morning was mostly forgotten and we were so glad we had started early as we passed an insane number of people heading up.